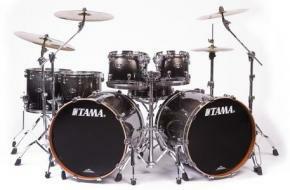 Miking a bass drum seems simple enough, but as anyone who has tried can tell you, you either can or you can’t. In general Bass frequency can get lost and muddy in a mix. Take a lean out the window in my neighborhood and the next ’68 Impala to drive by will prove my point. The problem isn’t the drum, or the microphone, but the mic placement! 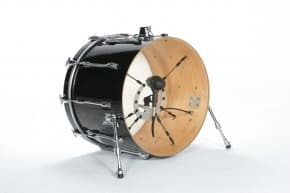 Cutting a hole in the front head certainly can help in placing the mic where it’s isolated from the sounds made by the other drums, but the player loses the “feel” of the kick; it dries it up too much. 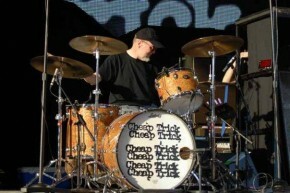 The other idea that has worked for many is to mount a mic to the inside of the bass-drum shell on a short mic-stand gimble. This works well at keeping the front head intact and keeping the drum’s “feel”, but it puts the mic extremely off center and most of the time the little mic-stand slips leaving you scrambling to yank a head off to put things right. 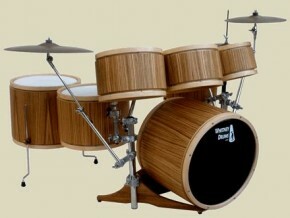 Plus there are the holes you have to drill into your nice expensive-custom-rare-exotic-one-of-a-kind-bass-drum! NOT! The Shu is ringed with ten rubber-grommeted holes that get hooked up with small elastic bungee cords. These shock-absorbent cords then attach to connector loops you place under the screws holding your lugs to your drum. When it’s all done it looks almost like a spider’s web with a kick-mic dead (no pun intended) center. You can even mount the Shu externally to the drum’s tension-rods which is a nice option for sound companies miking multiple bands or for stages where there may not be enough real estate on stage for a kick-mic stand. You could even put both positions into play for studio recording! Check for price. For more info on The Shu check out www.kellyshu.com or visit them at the 20th Annual Chicago Vintage and Custom Drum Show May 15th and 16th. Thank you for the great post about our product! We reallt appreciate the added exposure! If any of your readers have specific questions about The Kelly SHU system, they are welcome to contact us by email or phone 1-402-421-1169. 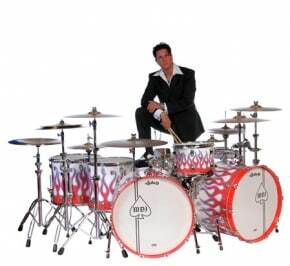 Please stop by by booth 122 at the Chicago Drum Show to meet us and see The Kelly SHU in person!